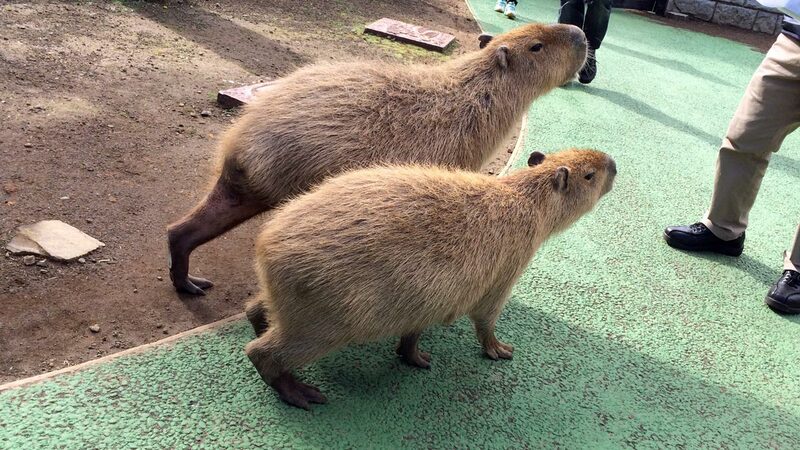 I love the world's largest rodent, the capybara. When I express this to friends in the West, they usually freak out, imagining a monster rat. But that's not it at all. 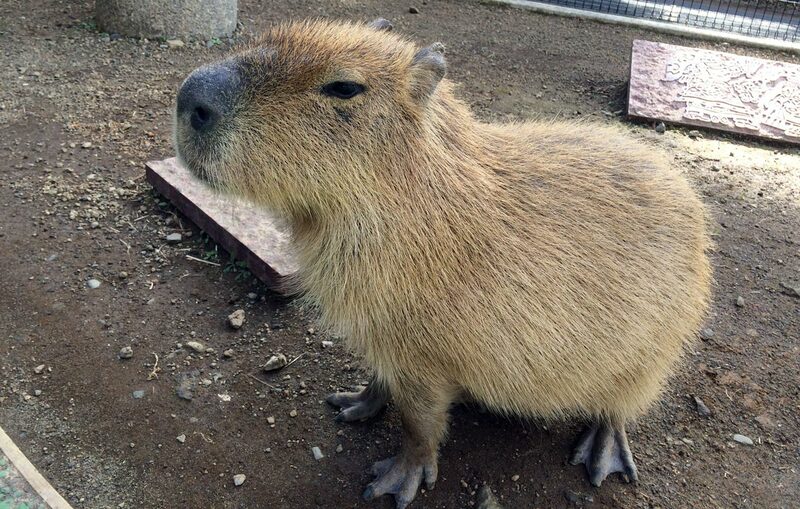 These South American animals are more like adorable, semi-aquatic guinea pigs. 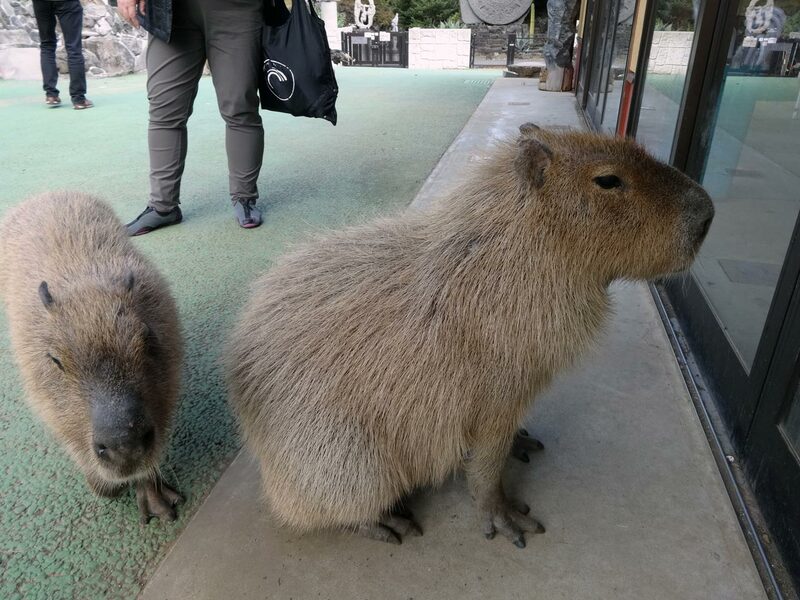 Walk among the capybaras and pet them. 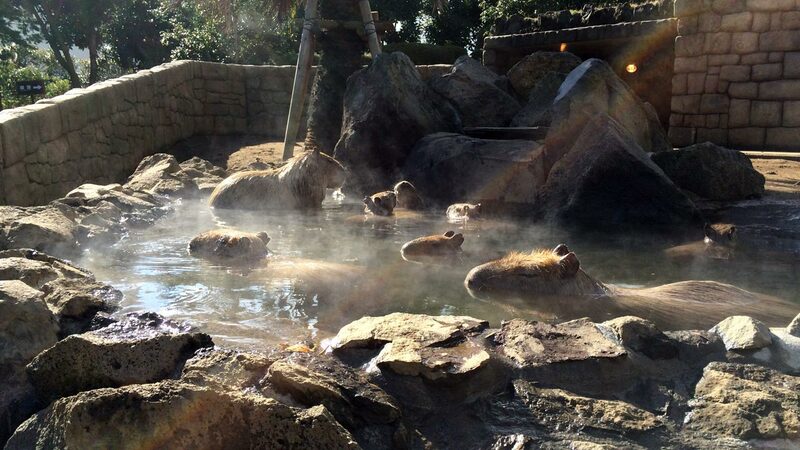 Watch capybara soak in an onsen. Both of these just happened to be life goals of mine. 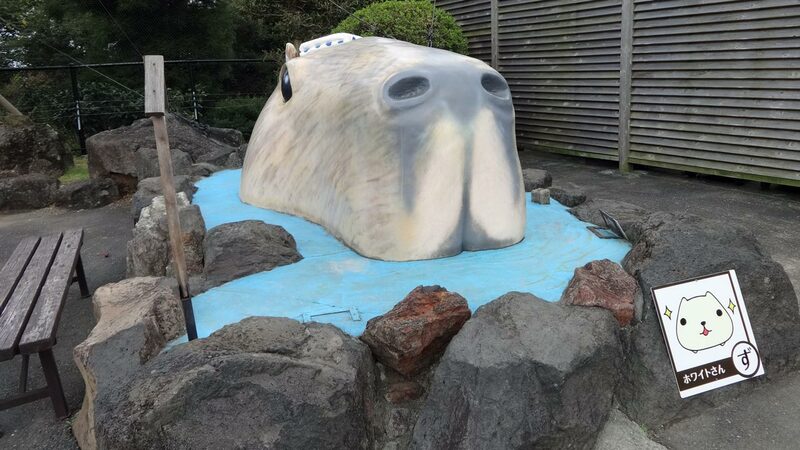 Knowing this, my friend suggested we go to Izu during my recent trip to Japan. 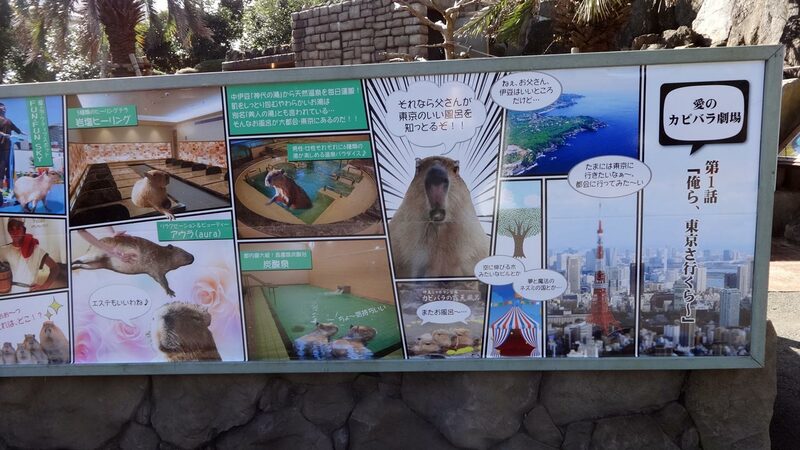 I squealed in delight because I knew Izu Shaboten Park is the site of the very first capybara onsen. 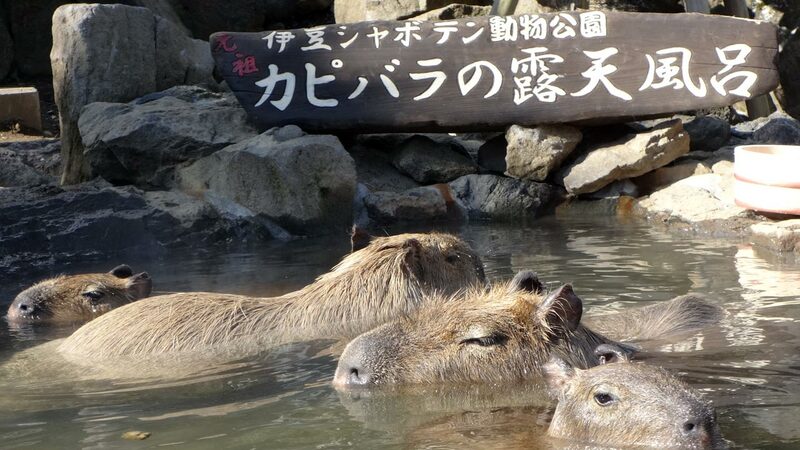 I was finally going to get to watch capybara bathe in hot springs. 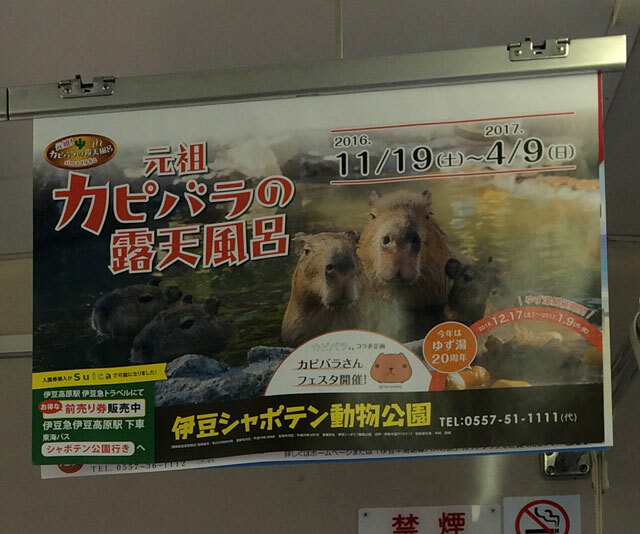 The capybara suspense started before we even got to Izu: on the train, there was an ad for the park featuring the capybara onsen. This raised my excitement level, but I had to wait. 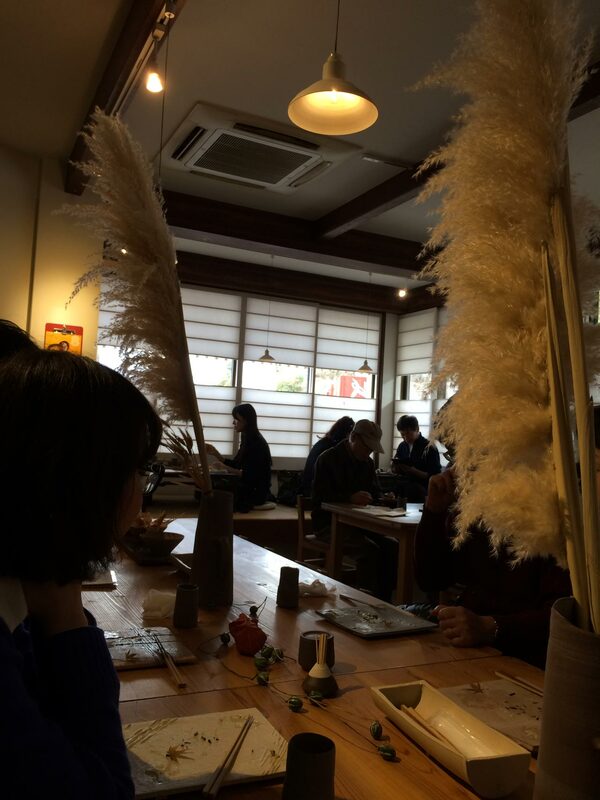 Our plan was to first spend the evening at the onsen hotel and then go to the park the next morning. 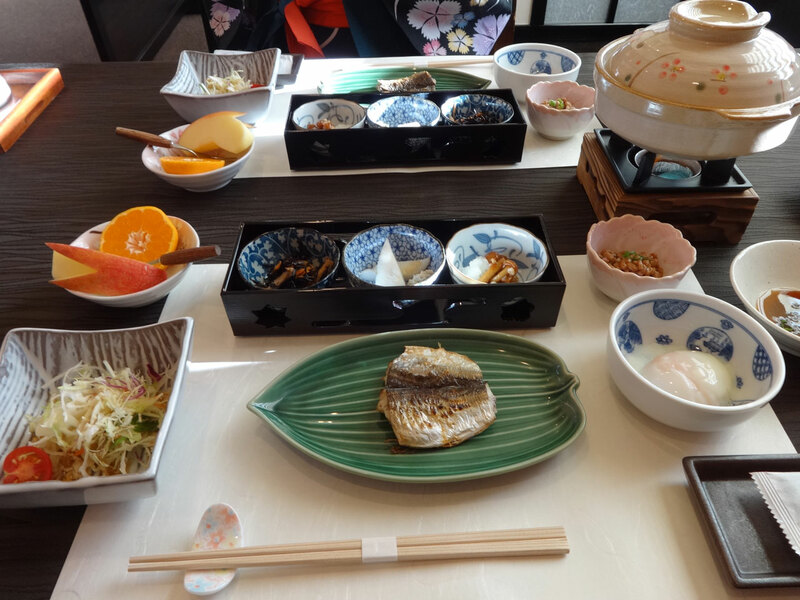 And so was the food, with both traditional Japanese dinner and breakfast included. The next day, we took the train back to the stop closest to Izu Shaboten Park. 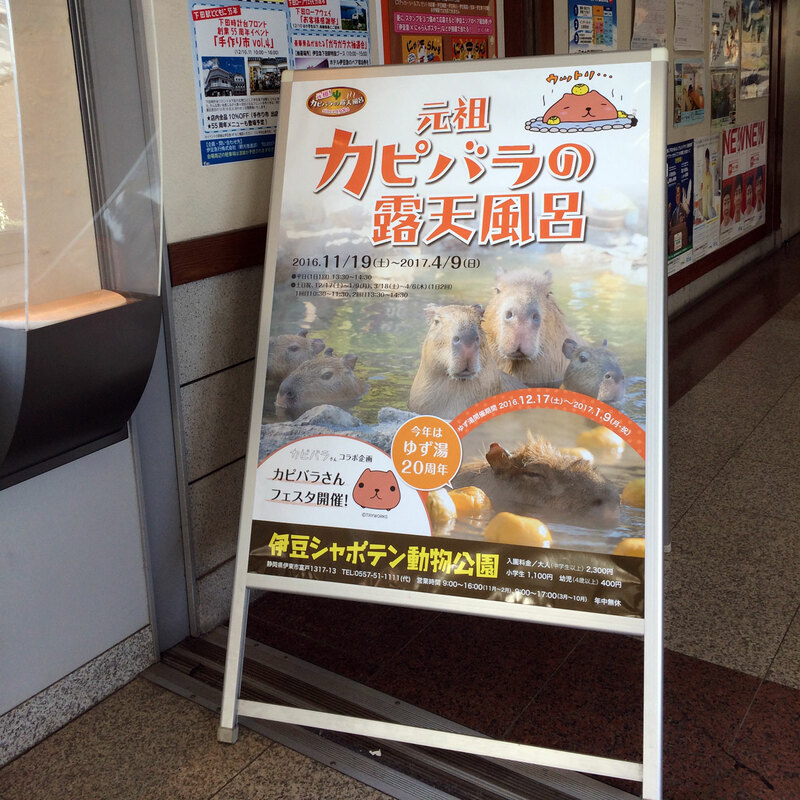 The capybara onsen was advertised there too, further ramping up my expectations. 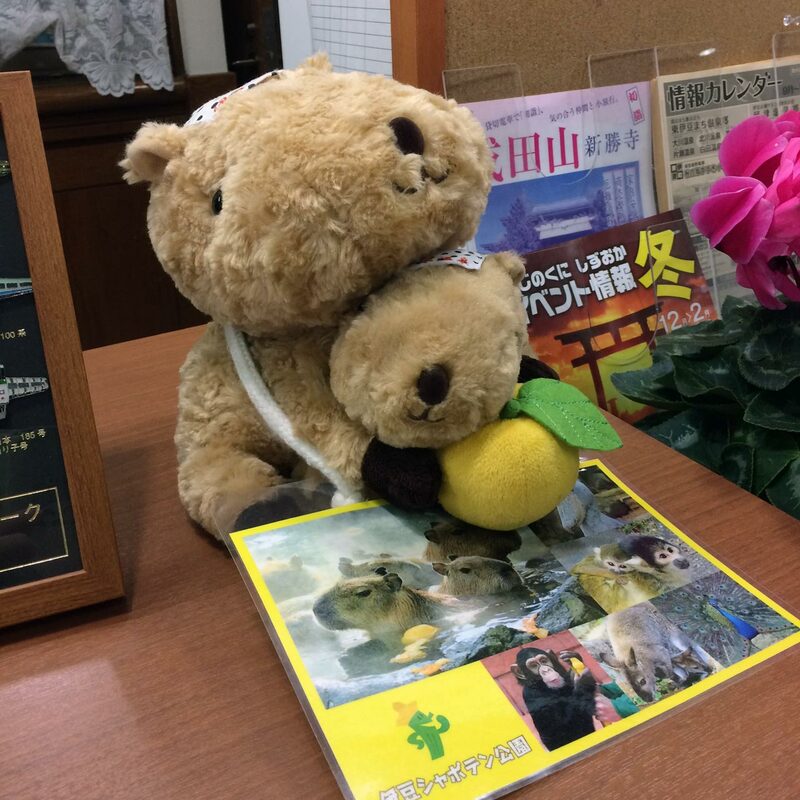 They had posters, and on the counter, a stuffed capybara with its own stuffed yuzu. Finally, there it was. 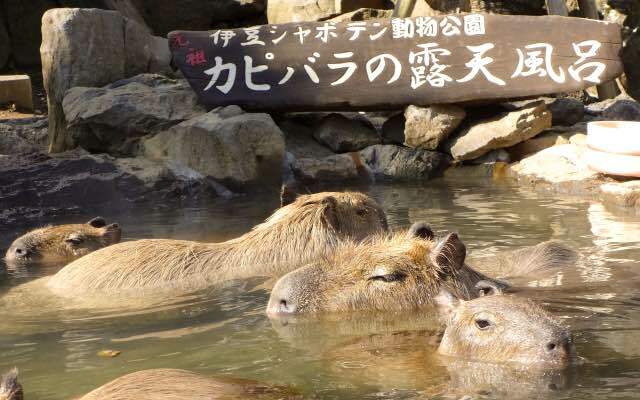 The original capybara onsen. There are no words. Except maybe: Magical! 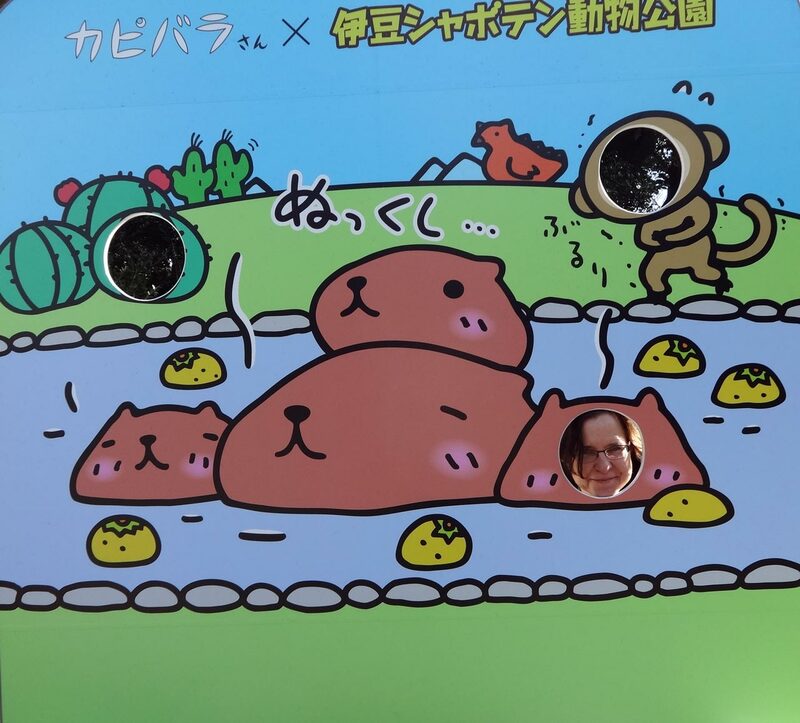 When we arrived at the park and looked at the map, we made a life-changing discovery: they didn't have just a capybara onsen. 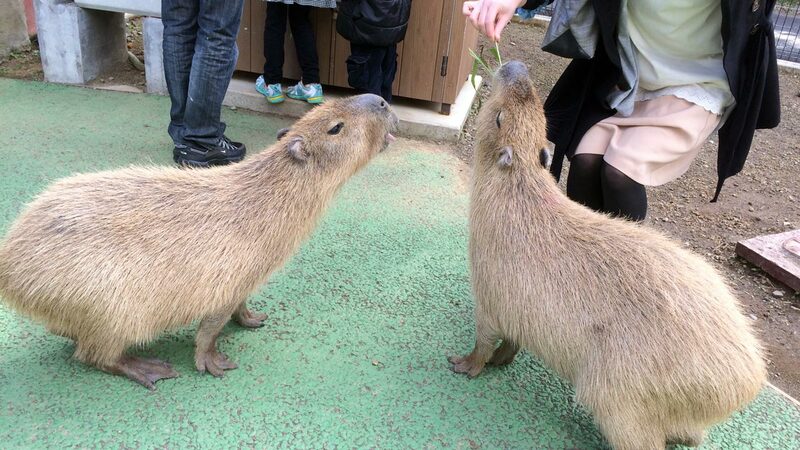 They also had a place where you could feed and touch capybaras, too! To my surprise and glee, I would be achieving both of my capybara life goals in one day. We had to see the onsen first, because the bathing only takes place at scheduled times (they have to drain it and clean it regularly for reasons you can probably imagine). I trotted quickly past sights that would normally stop me dead in my tracks, like a trained dog show and free-range monkeys. Sorry, monkeys, I had a life goal to achieve. I could have stayed here all day (much to my friend's chagrin, I'm sure), but I had another life goal to achieve. So after awhile we headed across the park to the capybara corral past various, often capybara-themed decorations. The banner in front of the onsen. I didn't have time to puzzle out the visual narrative going on here. 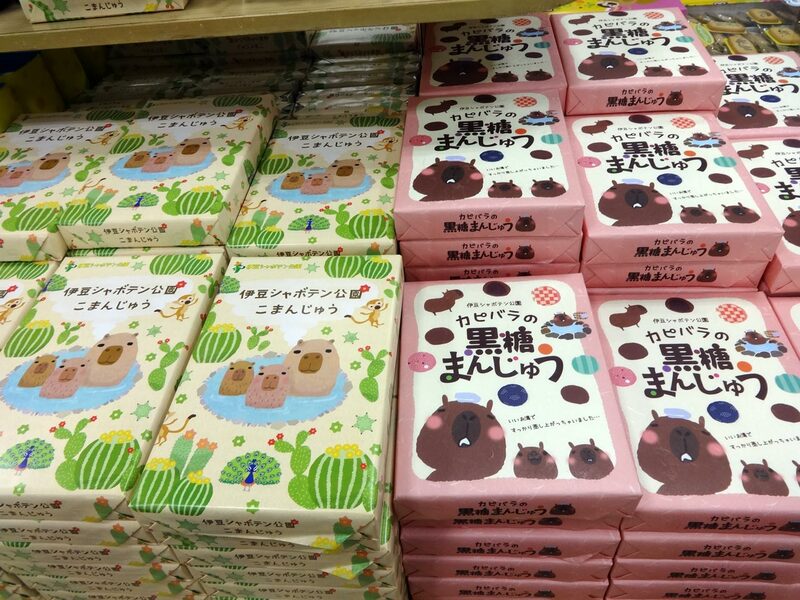 But I did take a moment to stop here, because how I could I pass up the chance to be photographed as Kapibara-san? But sometimes you could get a photo of them just standing there being cute. And one of them seemed to get bored of us, and stood at the door of the small building as if hoping to be let in. 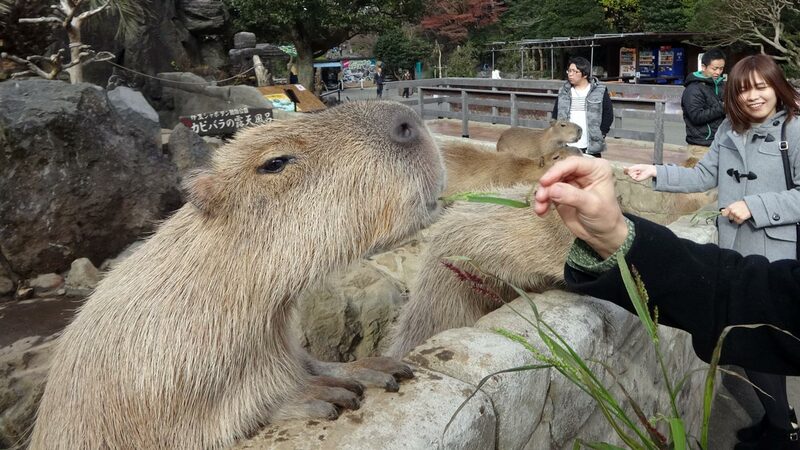 Between bath sessions, you're able to feed the capybara. A nice consolation if you happen to miss the bathing. I could also have stayed there all day, but it was clear this was taking a lot longer than my friend had expected. I had to have mercy on her and cut it short. 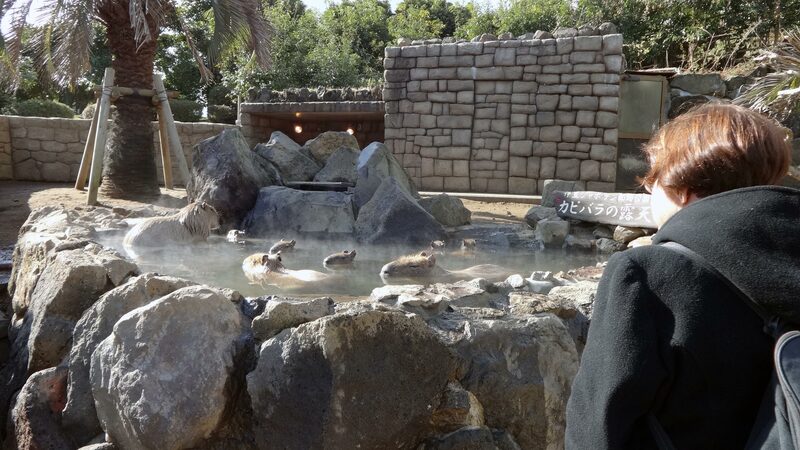 Also, I did want to see the onsen one more time. 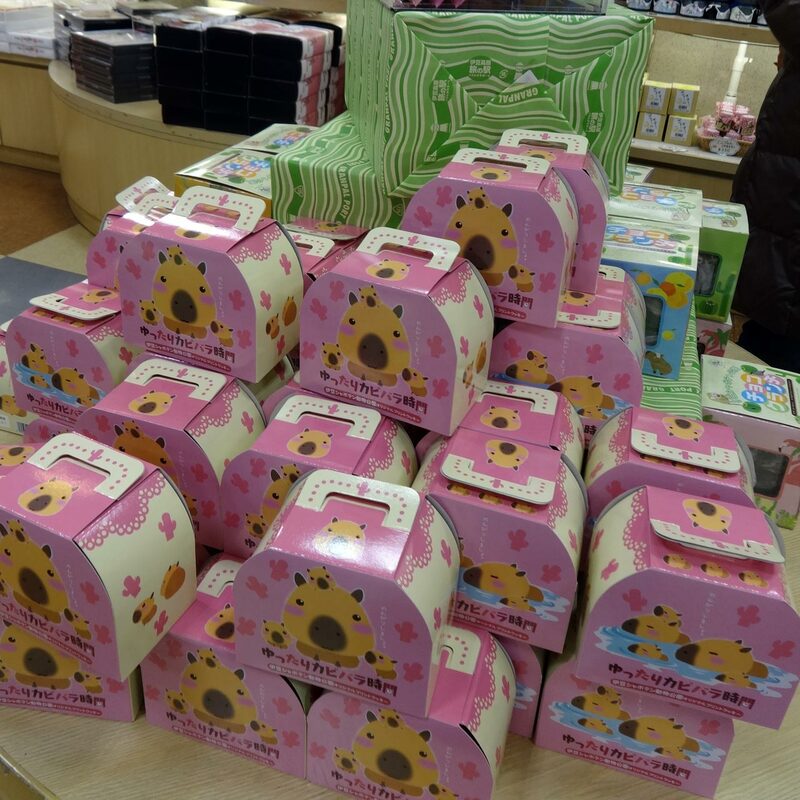 And very importantly, there were capybara omiyage to buy at the gift shop on our way back across the park, including the expected capybara-themed boxed cookies. When we got back to the capybara's onsen the water had been drained, but this wasn't as big a disappointment as you would expect. 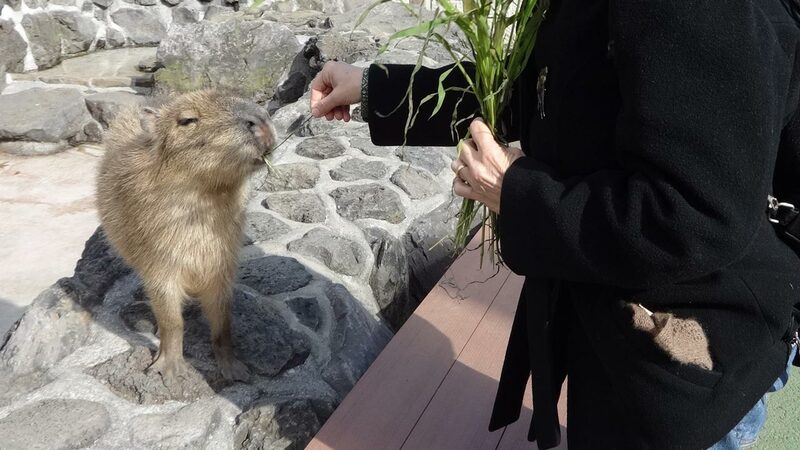 Between bath sessions, you're able to feed the capybara. A nice consolation if you happen to miss the bathing. Of course I instantly started buying more bunches of grass, as my friend stood mystified. She clearly didn't understand the level of obsession she was dealing with. Once we had both completely run out of ¥100 coins (or so my friend told me…) we headed out of Izu Shaboten Park. 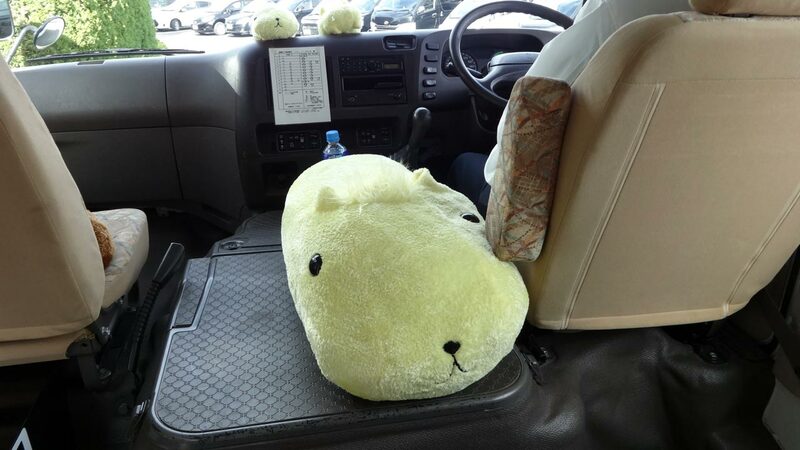 En route we got to experience more capybara decor. The most amazing was this giant sculpture of a capybara head in an onsen. 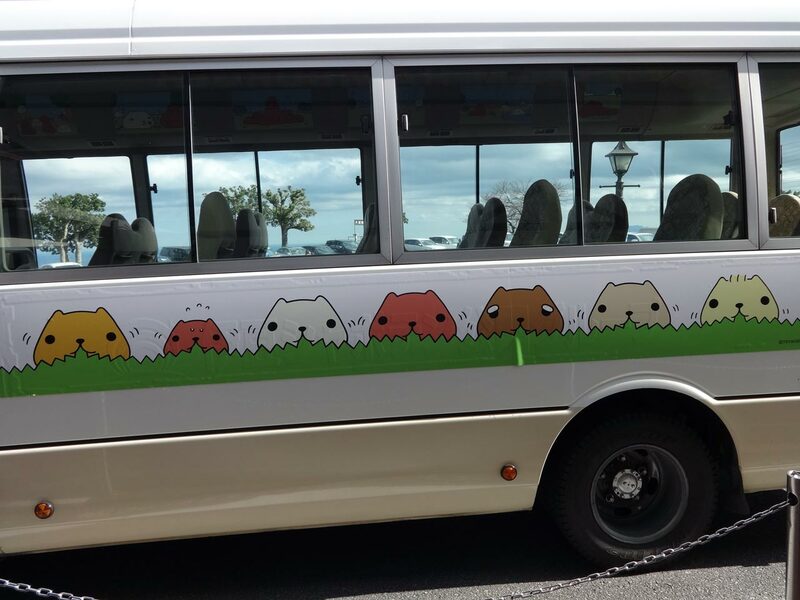 The Kapibara-san-adorned bus was pretty good too, with illustrations on the outside and a stuffed Kapibara-san to keep the driver company. 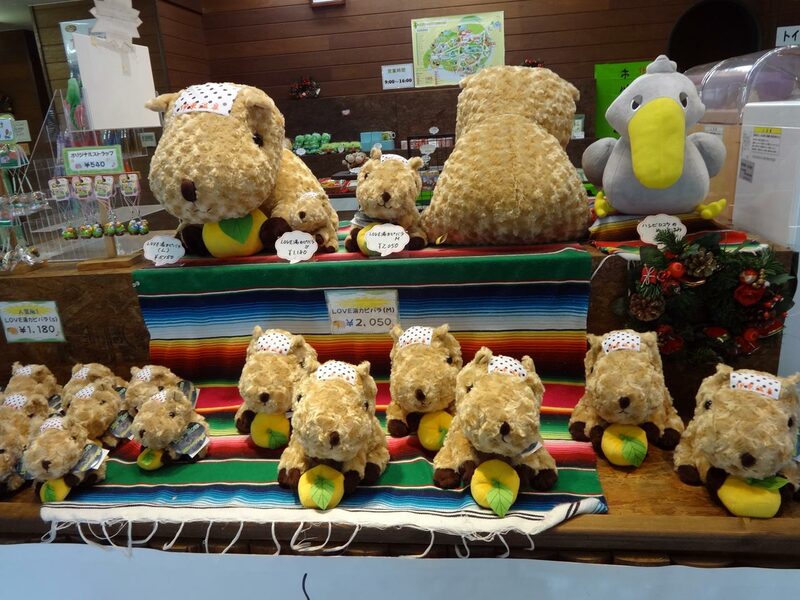 In case you regret not buying one of those stuffed capybaras with its own yuzu, the bus depot building at the end of the ride has last-minute souvenirs. 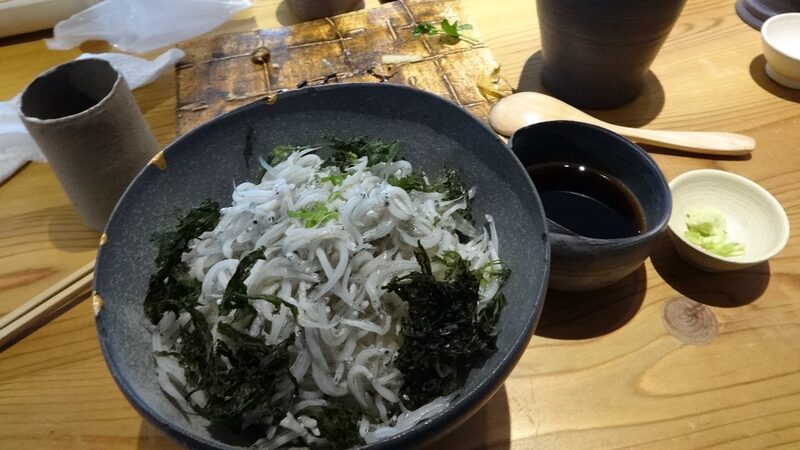 I'm afraid I'll never be able to eat a shirasu bowl from the konbini again now that I know how amazing they can be. 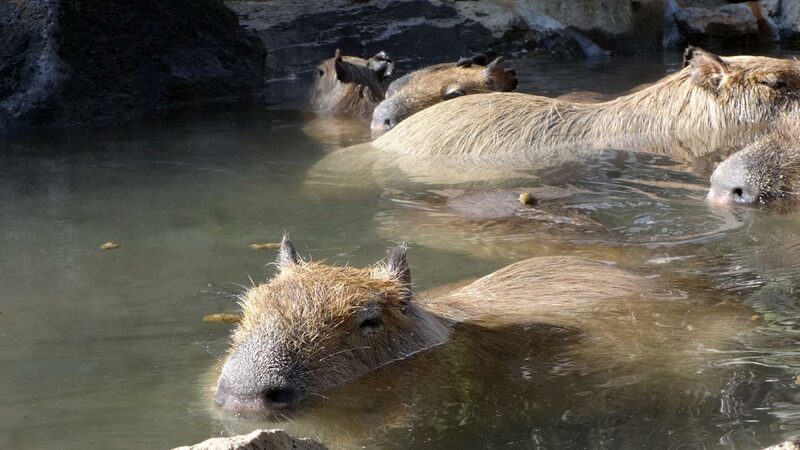 Maybe the capybaras worked their magic on lunch too. We had decided to skip the zoo food (in my experience zoo food is terrible), which left us terribly hungry at the bus stop. But as we waited for the bus to the train station, my friend looked across the street and realized there was a restaurant there that she had been to before. 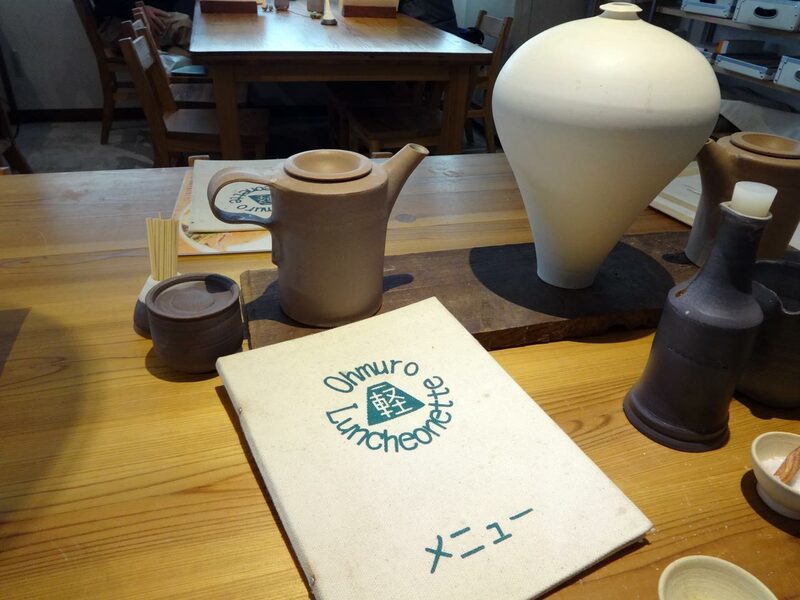 It was called Ohmuro Luncheonette. To me luncheonette describes a classic American diner. But as we entered, it became clear that "Luncheonette" might be one of those words that Japanese has borrowed and given a different nuance. This was no greasy spoon, as you could see right away from the beautiful pottery. And I'm afraid I'll never be able to eat a shirasu bowl from the konbini again now that I know how amazing they can be. Dessert was fabulous too and the room was plain but elegant. A totally amazing place to find on the side of the road in basically the middle of nowhere. As ridiculous as it probably sounds, to me this was the experience of a lifetime. It was even better because part of it was a surprise: I got to achieve both of my capybara life goals instead of the one I was expecting. For the, shall we say, more normal traveller, though, what's the verdict? 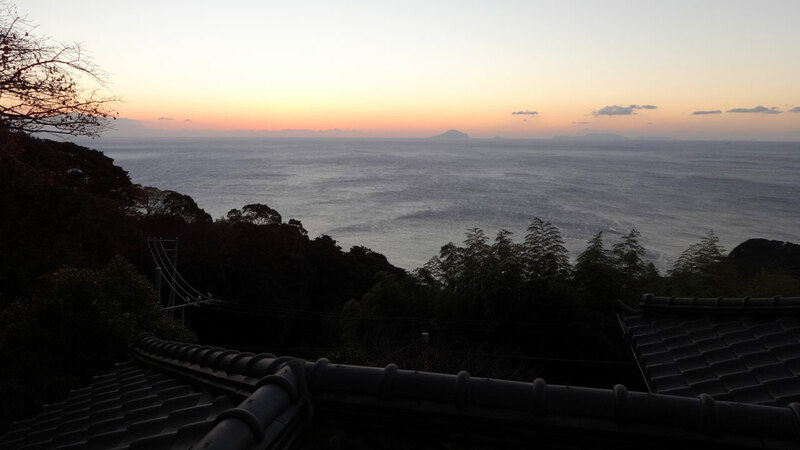 Izu has a beautiful coast and a lot of onsen resorts, so you might find yourself there for other reasons. If so, why not stop and commune close up with the world's largest rodents? 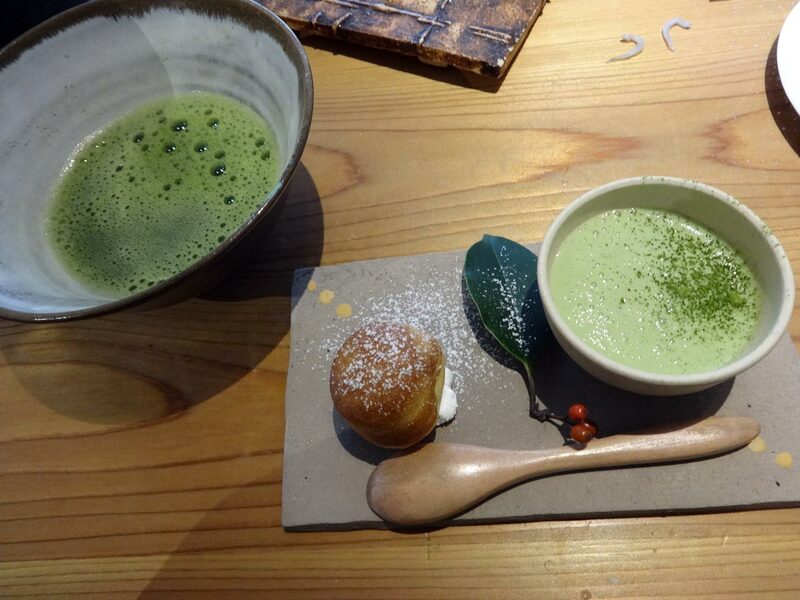 It's something you can't do at home, so it totally counts as a unique Japanese cultural experience.